Stallworth at Redskins training camp in 2011. Donté Lamar Stallworth (born November 10, 1980) is a former American football wide receiver who played ten seasons in the National Football League (NFL). He was drafted by the New Orleans Saints in the first round of the 2002 NFL Draft. He played college football at Tennessee. Stallworth has also played for the Philadelphia Eagles, New England Patriots, Cleveland Browns, Baltimore Ravens, and Washington Redskins. Stallworth was born in Sacramento, California. He attended Grant Union High School in Sacramento, California where he was a star in football and track and field, PR of 10.49 seconds in the 100 meters and 7.16 meters in long jump. He was a high school teammate of former Minnesota Vikings running back Onterrio Smith, Seattle Seahawks safety C. J. Wallace and Tampa Bay Buccaneers wide receiver Paris Warren. Stallworth played college football at the University of Tennessee for the Volunteers, where his nickname was "Hands," as his teammates watched his ability to come up with seemingly impossible catches on a regular basis. Upon leaving for the NFL, his 1,747 reception yards ranked ninth in the school's all-time list. He majored in psychology. Stallworth was selected by the New Orleans Saints in the first round (13th overall) of the 2002 NFL Draft. He made his NFL debut versus the Tampa Bay Buccaneers on September 8. He caught eight touchdown passes in 2002, his rookie year, but saw less action the next season. As a full-time starter in 2004, he had 767 receiving yards and five touchdowns. In 2005, he recorded a career-high 70 receptions for 945 yards with seven touchdowns. Donté Stallworth during his season with the Eagles. 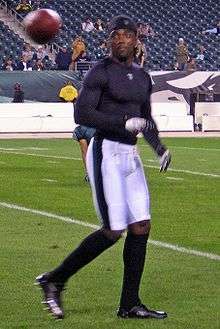 On August 28, 2006, Stallworth was traded to the Philadelphia Eagles for linebacker Mark Simoneau and a conditional fourth round pick in the 2007 NFL Draft. In Stallworth's first game with the Eagles, less than two weeks after the trade, he caught six passes for 141 yards and a touchdown. Due to a nagging hamstring injury, he missed three games early in the regular season, but finished the year with 725 yards and five touchdowns. Hamstring injuries have been a persistent problem throughout his professional career. In March 2007, The Philadelphia Inquirer reported that Stallworth was in the league substance abuse program. On March 11, 2007, Stallworth agreed to terms with the New England Patriots on a reported six-year deal worth $30 million with $3.5 million guaranteed. The contract was incentive laden, meaning that the Patriots could release him if he underperformed for a small fraction of the full contract. On February 22, 2008, the Patriots declined the option on his contract and he became a free agent. On March 1, 2008, Stallworth signed a seven-year, $35 million deal with the Cleveland Browns. However, he had just 17 catches for 170 yards and one touchdown for the Browns in 2008 and then missed the entire 2009 season after being suspended by the NFL following his conviction on manslaughter charges. On February 8, 2010, after being reinstated by the NFL, the Browns terminated Stallworth's contract. On February 16, 2010, Stallworth signed a one-year, $900,000 deal with the Baltimore Ravens. On August 28, 2010, Stallworth broke his foot in a preseason game against the New York Giants. Head Coach John Harbaugh stated that this injury was not season-ending and Stallworth would be back after the Ravens' bye week. Stallworth made his return to the active Ravens roster in October, but his highlight of the season came during a game against the Carolina Panthers where he made his first catch as a wide receiver for the franchise during a regular season game. On December 23, 2010, Stallworth was voted by his teammates and awarded the Ed Block Courage Award for 2010. But his stats were grim. He had just two receptions for 82 yards, and five rushes for 45 yards. Stallworth signed a one-year deal with the Washington Redskins on July 29, 2011. On November 8, 2011, Stallworth was released by the Washington Redskins and put on waivers. On November 15, 2011, he re-signed with the Redskins after wide receiver, Leonard Hankerson, and defensive end, Kedric Golston, were put on injured reserve. After his return to the team, Stallworth would catch a touchdown pass in the endzone in Week 11 against the Dallas Cowboys allowing the Redskins to go into overtime. At the end of 2011 season, Stallworth recorded 22 receptions, 309 receiving yards, and two touchdowns. On March 19, 2012, Stallworth signed with the New England Patriots. On August 27, 2012, Stallworth was released by Patriots. On December 3, 2012, Stallworth re-signed with the Patriots because of a broken right foot suffered by wide receiver Julian Edelman and lack of depth at the wide receiver position. On December 11, it was reported that Stallworth was placed on injured reserve with an ankle injury after only playing in one game during his brief return and making a 63-yard reception for a touchdown. Stallworth re-signed with the Redskins on June 12, 2013. On August 26, 2013, Stallworth was waived by the Redskins. In September 2014, Stallworth was hired by The Huffington Post for a six-month fellowship covering national security politics full-time, based in the company's Washington, D.C. office. He has covered stories ranging from United States relations with Cuba to Hillary Clinton's Israel policies and Iran's nuclear program. Although the fellowship lasted six months, Stallworth expressed hope that he would be hired permanently. Stallworth was hospitalized on March 16, 2013, with serious burns after the hot air balloon carrying him and two other people crashed into power lines above South Florida. On the morning of March 14, 2009, Stallworth struck and killed a pedestrian while driving his car at the eastern end of the MacArthur Causeway in Miami Beach, Florida. Stallworth was headed toward the beach when he hit Mario Reyes, 59. Police initially investigated the accident further to see if charges against Stallworth would be warranted. Stallworth admitted to drinking the night prior to the accident. According to early reports Stallworth was legally drunk and was reportedly under the influence of marijuana at the time of the accident; news sources reported that his blood alcohol content was 0.12, over the nationwide legal limit of 0.08. Stallworth claims that he flashed his car's headlights to warn Reyes before striking him. A Miami Beach police report said Reyes was not in a crosswalk on the busy causeway when he was struck by the black 2005 Bentley Continental GT driven by Stallworth. Police estimated Stallworth was driving about 50 mph in a 40 mph zone. The construction crane operator was trying to catch a bus home after finishing his shift around 7:15 a.m.
Stallworth was charged with DUI manslaughter on April 1, 2009; he surrendered to police on April 2, 2009, and was released on $200,000 bail. As a result of a plea deal, he received a sentence of 30 days in the county jail, plus 1,000 hours of community service, 2 years of community control, and 8 years' probation. He has also received a life-time suspension of his Florida state driver's license. On July 10, 2009, Stallworth was released from county jail after serving 24 days of a 30-day sentence. The Associated Press reported on June 16, 2009, that Stallworth and the Reyes family reached a financial agreement, avoiding a civil lawsuit. The amount of the settlement was not disclosed. On August 13, 2009, NFL commissioner Roger Goodell stated that Stallworth would be suspended for the entire 2009 season without pay. Stallworth was reinstated after Super Bowl XLIV. A Yahoo! Sports story published August 12, 2010, reported that Stallworth's lawyers indicated he could have fought all charges with "an excellent chance of being found innocent," but that Stallworth chose to be convicted of a felony to do what he felt was morally right. The article later notes that David Cornwell, one of Stallworth's attorneys, felt there was irony in the reaction to Stallworth's decision because the public and media criticized the plea deal without knowing the full story. ↑ "Donte' Stallworth, WR - Tennessee". USA Today. April 20, 2002. ↑ "Donte Stallworth News". Yahoo! Sports. Retrieved 2010-11-26. ↑ "2010 Ed Block Courage Award". ↑ "Cowboys Vs. Redskins Score Update: Donte Stallworth Touchdown Ties Game At 24". dc.sbnation.com. Retrieved 2011-11-20. ↑ "Roster Review: Wide Receivers". Redskins.com. Retrieved 2012-02-28. ↑ Rosenthal, Gregg (August 27, 2012). "Jabar Gafney, Donte' Stallworth cut by Patriots". NFL.com. Retrieved 2012-08-27. ↑ Rosenthal, Gregg (December 11, 2012). "Donte' Stallworth on Patriots' IR; Deion Branch to sign". NFL.com. Retrieved 2012-12-11. ↑ Tinsman, Brian (June 12, 2013). "Stallworth, Henderson Add Veteran Depth". Redskins.com. Retrieved 2013-06-12. ↑ Wesseling, Chris (June 12, 2013). "Donte' Stallworth, Devery Henderson join Redskins". NFL.com. Retrieved 2013-06-12. ↑ Tinsman, Brian (August 26, 2013). "Redskins Trim Roster Ahead Of Cuts". Redskins.com. Retrieved 2013-08-26. 1 2 3 "Donte' Stallworth Stats". ESPN Internet Ventures. Retrieved 18 March 2014. ↑ "NFL veteran Donte Stallworth injured in hot-air balloon crash". CBS News. Retrieved 16 March 2013. ↑ http://sports.espn.go.com/nfl/news/story?id=4014292&campaign=rss&source=ESPNHeadlines Retrieved on 2009-03-25. ↑ Associated Press (2009-03-14). "Browns WR Stallworth hits, kills Fla. pedestrian". MSNBC.com. Retrieved 2009-03-14. ↑ Archived June 25, 2009, at the Wayback Machine.